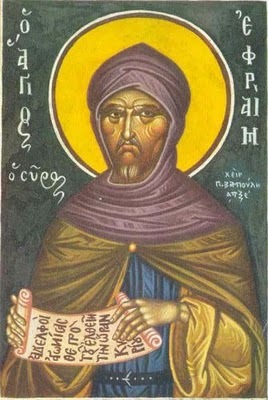 When Saint Ephraim visited Caesarea, he desired to meet the great Basil, the fountain of Orthodox dogmas and the champion of piety. Saint Ephraim, who was a clairvoyant, greatly commended the Archbishop of Ceasarea, whom he beheld with the eyes of his soul. In his vision he beheld the great Basil with a dove, flashing forth light as brilliant as the sun on the hierarch's right and speaking in his ear. Ephraim then observed Saint Basil teaching the people whatever he heard being uttered by the divine dove. This same dove also illumined the mind of the venerable Ephraim that what was taking place was through the grace of the All-Holy Spirit, and he rejoiced in spirit. Saint Ephraim's vision was also confirmed by the good report of the wonders of Saint Basil. Thereupon, Ephraim supplicated God to reveal to him of what sort was the saint. Then Ephraim was vouchsafed to behold a pillar of fire, which rose up into the heaven; and he heard a voice saying: "Ephraim, Ephraim, even as this pillar of fire, so is the great Basil! "Then, without the least anxiety, Ephraim took along with him an interpreter who knew both the Greek and Syriac tongues, and went to Ceasarea. It was then the Feast of Theophany. He entered the church and observed Saint Basil clothed in splendid and costly vestments, celebrating the sacred Liturgy with great boldness. Ephraim then reproached himself and said to his interpreter: "In vain have we labored, brother, because this man, though he is found in such glory, is not as I saw." 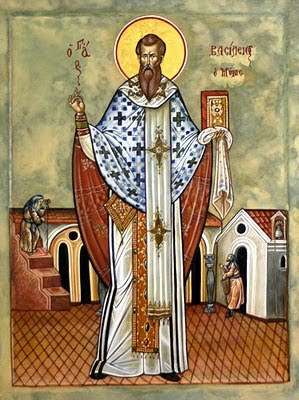 The holy hierarch, having been informed in the Spirit of these words which were uttered by Saint Ephraim, called one of his deacons to him, and instructed him: "Go to the western door of the church, and you will see two monks standing there: the one is beardless, tall, and thin; and the other has a black beard. Address the beardless monk, saying, 'You are to come to the holy bema, for thy father, the archbishop calls you.'" Thereupon, the deacon went; and with force he managed to make his way through the multitude. He announced the words of Saint Basil to the righteous Ephraim who, through the interpreter, answered: "You are in error, brother, because we are strangers and unknown. How then does the archbishop know us?" Unable to answer, the deacon returned to the archbishop. He related the words of Saint Ephraim to the sacred hierarch, who again sent him forth, instructing him: "Go and say, 'Lord Ephraim, come into the holy bema, because the archbishop calls you." Therefore, the deacon went a second time. Greeting Ephraim with a prostration, he reported the message of the hierarch to the venerable monk. In turn, the righteous Ephraim made a prostration to the deacon, declaring: "Truly, the great Basil is a pillar of fire, for I beseech him that I may speak alone with him in the sacristy." When Saint Basil finished celebrating the Divine Liturgy, he summoned Saint Ephraim. After he greeted him with a holy kiss, he conversed with the desert father on spiritual matters and divine purposes and design. He then encouraged Ephraim that if there were any hidden matter in the heart to tell him of it. The righteous Ephraim spoke through the interpreter, saying: "I ask one favor of your prelacy, slave of God." Basil interjected: "Whatever you desire, ask; for I am greatly obliged to you on account of your labor which you endeavored for the sake of my lowliness." Saint Ephraim continued: "I know, holy master, that if you should make supplication for something to God, He would bestow it. Well, I desire that you would supplicate God that I might speak Greek, for I dot at all know this language of yours." Saint Basil responded: "Your request, holy father, is beyond my power. But inasmuch as you have asked this with faith, let us both entreat God, even as the One is able to make your request a reality; for even the Prophet David uttered, 'The will of them who fear Him shall He do, and their supplication shall He hear, and He shall save them'" (Ps. 144:20). After Saint Basil said this, he stood together with Saint Ephraim for a long while in entreaty. And when they finished their prayer, the saint cried with a loud voice: "The grace of the Holy Spirit be with you, and speak Greek!" Straightway, as Saint Basil uttered this command - O the wonder! - Saint Ephraim opened his mouth and was speaking Greek, even as Saint Basil and the Christians of that place. Now Saint Basil had been a great admirer of the holy Ephraim and was amazed at his erudition, though Ephraim had received no formal instruction. About this time Saint Basil desired for the holy hymnographer to return to Ceasarea with the intention of elevating him in clerical rank, but Ephraim was resolved not to accept such a dignity, and decided to feign madness. He went about the streets indecorously, dragging multicolored clothes, chewing on bread while drooling. Saint Basil's messengers were appalled at such conduct, and reported to him that they found his candidate to be a madman. Saint Basil exclaimed: "O hidden pearl of great price, whom the world knows not! You are the madmen, and he the sane one!" From The Great Synaxarion of the Orthodox Church (January), translated by Holy Apostle Convent, pp. 1101-1107.